To say this is a make-or-break year for Corey Crawford wouldn’t be original; he’s said it himself on more than one occasion since training camp opened. But the Blackhawks’ hopes of winning a second Stanley Cup inside five years rests between the pipes, and Crawford will need to back up his open self-assessment quickly when the new season begins. Let’s take a look at the two goalies on the Blackhawks roster as we get closer to the season (finally) beginning. The list of issues with the Blackhawks defense last year is long, and the blame shouldn’t fall on the goaltender(s) alone. The fact that Chicago was the only team in the league to not register at least one shutout last year has been talked about for months, but there are other disturbing statistics that speak to just how mediocre the Blackhawks were last season. Chicago allowed 170 goals during five-on-five play, which ranked 27th in the NHL last year, and the team’s combined 2.82 goals against average ranked 22nd in the league. The Blackhawks allowed the first goal in a game 46 times during last year’s regular season, a number that must improve; they did, however, battle back for a 19-19-8 record in games in which they trailed first. The second period felt like a killer to fans last year, and the season-ending statistics back up those emotions. The Blackhawks allowed 86 goals during the middle frame last year, which was the third-worst total in the NHL. By comparison, they allowed 70 and 71 goals in the first and third periods, respectively. The Good: Crawford has started 55 games in each of the last two seasons, and is the first Hawks netminder to post back-to-back 30-win seasons since Ed Belfour. The Bad: Crawford’s numbers went the wrong direction after a strong performance against Vancouver in the 2011 postseason. His confidence in himself was shaken, he lost the confidence of the coaching staff more than once last year, and the pressure is now squarely on the 29-year-old’s shoulders to be the guy that excited fans in 2010-11 and not the disappointment from last season. Emery stepped in a few times and was able to play effectively for the Blackhawks last season, but there are still questions about the Hawks’ depth at the position. One number that must be improved by Crawford and Emery (and anyone else that might contribute this season) is making saves. 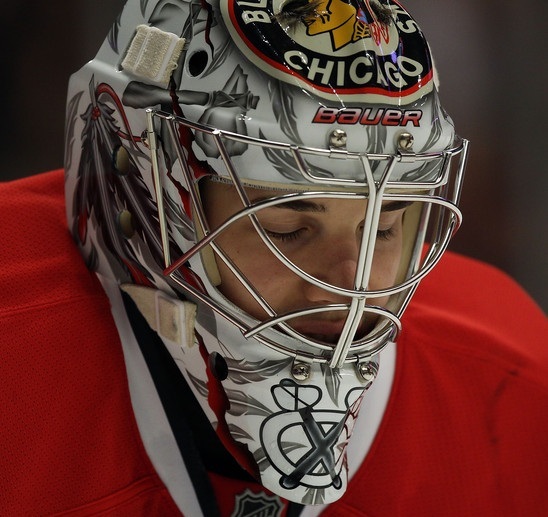 Last year, the Blackhawks’ netminders combined to post a .901 save percentage, which ranked 26th in the NHL. The four teams that trailed Chicago – Columbus, the New York Islanders, Toronto and Tampa Bay – all had one thing in common: they missed the playoffs. If the Hawks want to make a deep run, whomever is in net will have to be better. I think the best thing we can do for the goalie is be better defensively. Oslen showed his youth, Leddy was physical at all in the defensive zone, Hammer was what he needed to be, Monty had the consussion. Leddy should be a little wiser, Rosy brings experiance, Brookbank brings grit… I expect us to be alot better defensively, and when a goalie knows his defenders are laying all out there, they tend to step up in return. I agree with you Tim G. Any goalie is not going to perform as well as he can if his D-men are not where they should be doing their jobs. No matter how good, a goalie left hanging out to dry can’t carry everyone else. I think Corey had a sophomore year slump last year. Hopefully things will be looking up. I have a good gut feeling about this season. It sure is nice to be able to talk about our goaltending, finally. Corey Crawford isn’t a terrible goalie, or an awful goalie. He’s an average NHL goalie who needs really good defense to be effective. His biggest problem is that he does NOT track the puck very well. To his credit, Bowman went out and got (2) guys who can help in Brookbank and Rosival. Both of these guys are physical AND they BLOCK SHOTS, which is HUGE in todays NHL. 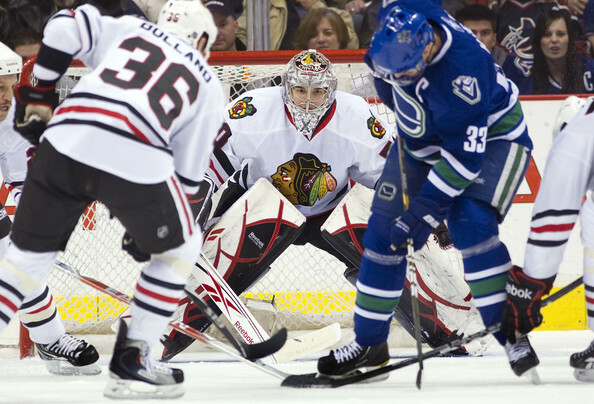 Crawford is “big” in the net when he plays on top of his crease. Unfortunately, he gets caught on the goal line way to often. He covers up the five hole pretty well and moves well side to side. Again, he’s not Patrick Roy, but he’s a “middle of the road” NHL goalie who does okay when he has help. He’ll never steal you a series, but he can keep you in a series and give you a chance to win. Remember, he was in the AHL until he was 26 years old, so he wasn’t the second coming of Jonathan Quick, either. But the kid has heart!! In the NHL, heart can take you a long way. Sometimes, heart can take you farther than skill. 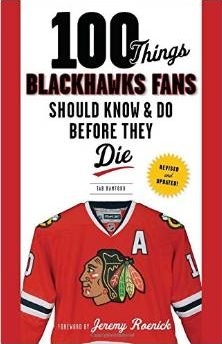 I guess we’ll see how far Crawford’s heart will take the Hawks. I was checking out various websites trying to get a gauage on where people see this Hawks team, because I’m torn on how good they are. Anyways I saw that interesting nugget which I havent heard but I love knowing(yes, I know its from espn but still). According to colleague Pierre LeBrun, the Blackhawks talked trade with the Kings regarding talented backup Jonathan Bernier during the summer. If that is accurate I really like them kick those tires. I also like it because Bernier is a guy most hockey people “loved”, but Quick has a ring and long term deal and Bernier wants his shot. He is a 2006 draft pick. Either way Crow needs a huge year otherwise this year might be his last as a NHL starter.